Florinda Lorenzo came to the U.S. from Guatemala 14 years ago. She checks in with ICE regularly — a requirement stemming from a 2010 arrest, though the charges were later dropped. She says the check-ins have become "painful and stressful" because she's worried she will be detained. But with the Trump administration's crackdown on illegal immigration, that once-routine check-in has become a nerve-wracking experience. In recent weeks, some immigrants say they've been detained without warning at their ICE check-ins. "It creates a lot of chaos for me," Lorenzo says through an interpreter. "I know lots of people are getting deported now, and I wouldn't want to be deported." Lorenzo came to the U.S. from Guatemala 14 years ago. 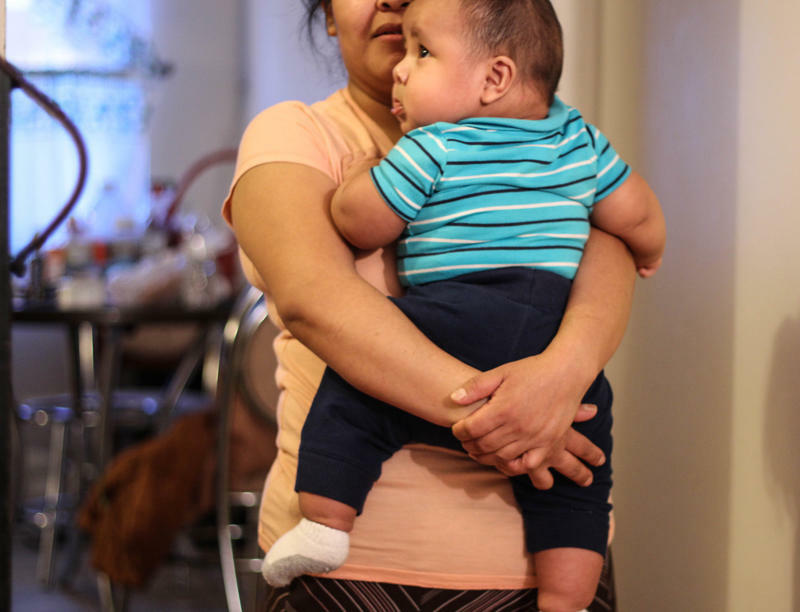 She has three children, two of them U.S. citizens who were born here. Lorenzo was arrested in 2010 and charged with selling prepaid phone cards without a license. The charges were dropped, but she's been required to check in with ICE since then. Before her most recent appointment earlier this month, Lorenzo looked nervous. Her eyes were red. "It's hard for my family, for me ... my kids, my husband," Lorenzo says. "It's very painful and stressful for me. ... I just hope I go back to my children today." A few dozen friends gathered to pray and show their support — both for Lorenzo's sake, and for ICE officials, in case they were watching. Nick Katz, a lawyer with CASA de Maryland, an immigrant advocacy group, accompanied Lorenzo to provide legal help in case she was detained. "The environment is so uncertain," Katz says. "We've heard stories of people being taken into custody. We know of at least one mother who was taken into custody out of a check-in." Across the U.S., judges have issued final removal orders for more than 900,000 people in the country illegally. Many remain as long as they check in regularly with ICE. Under the Obama administration, they were not considered priorities for deportation because they had clean criminal records, or strong ties to their communities. The Trump administration, however, is taking a more aggressive enforcement stance. President Trump signed executive orders that broadly expanded the number of people who are priorities for deportation. That category now includes many immigrants whose only offense may be entering or staying in the country illegally. Hans von Spakovsky, senior legal fellow at the Heritage Foundation, a conservative think tank in Washington, applauded the move. Von Spakovsky says criminals should be the priority. But, he says, that doesn't mean everyone else should get a free pass. "You're in the United States illegally; you broke the law to come here illegally," von Spakovsky says. "And the government agency is basically saying, 'That's OK, we're not going to do anything about it.' That just to me is a complete violation of the rule of law." An ICE spokeswoman did not respond to questions about the check-ins. Several cases of unauthorized immigrants being detained at their ICE appointments have gotten widespread attention. That could have unintended consequences, says Alonzo Pena, who served as deputy director of ICE in the Obama administration. If agents detain large numbers of immigrants at their check-ins, he says, other immigrants may decide it's too risky to report. "It's going to send a bad message to others, and it's going to really backfire," Pena says. "They lose faith in the system ... and you don't know where they're at. "There's nothing good that will come out of that," he says. Lorenzo emerges from her appointment in the ICE field office with a smile on her face. "I feel very happy right now. ... My heart isn't as heavy anymore," Lorenzo says. "I don't have the words, but I feel relief." Lorenzo found out that she can stay, at least for a few more months. She doesn't have to check in with ICE again until October. But neither Lorenzo nor her lawyers can say what will happen when she does. Many immigrants living in the United States illegally are not in hiding. Hundreds of thousands check in with federal authorities on a regular basis. Past administrations considered them a low priority for deportation. Now that once routine check-in, though, has become a nerve-racking experience as NPR's Joel Rose reports. 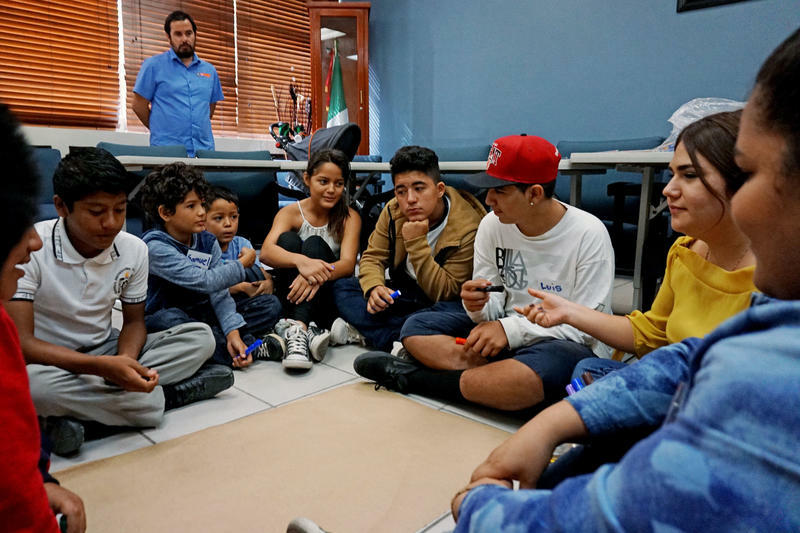 JOEL ROSE, BYLINE: Florinda Lorenzo visits the local offices of U.S. Immigration and Customs Enforcement or ICE in downtown Baltimore several times a year. It had become routine, almost like a trip to the dentist. But Lorenzo says this time feels different. FLORINDA LORENZO: (Through interpreter) It creates a lot of chaos for me. I know lots of people are getting deported now, and I wouldn't want to be deported. ROSE: Lorenzo was arrested in 2010 and charged with selling prepaid phone cards without a license. The charges were dropped, but she's been required to check in with ICE ever since. This time Lorenzo looks nervous, and her eyes are red. Lorenzo came to the U.S. from Guatemala 14 years ago. She has three children, two of them born here, so they're U.S. citizens. LORENZO: (Through interpreter) It's hard for my family, for me, my kids, my husband. It's very painful and stressful for me. I just hope I go back to my children today. UNIDENTIFIED WOMAN: Good morning, everyone. ROSE: A few dozen friends gather to show their support both for Lorenzo's sake and for ICE officials in case they're watching. Nick Katz is a lawyer with CASA, an immigrant advocacy group. He's here to help in case Lorenzo is detained by ICE. NICK KATZ: The environment is so uncertain. We've heard stories of people being taken into custody. We know of at least one mother who was taken into custody out of a check-in. 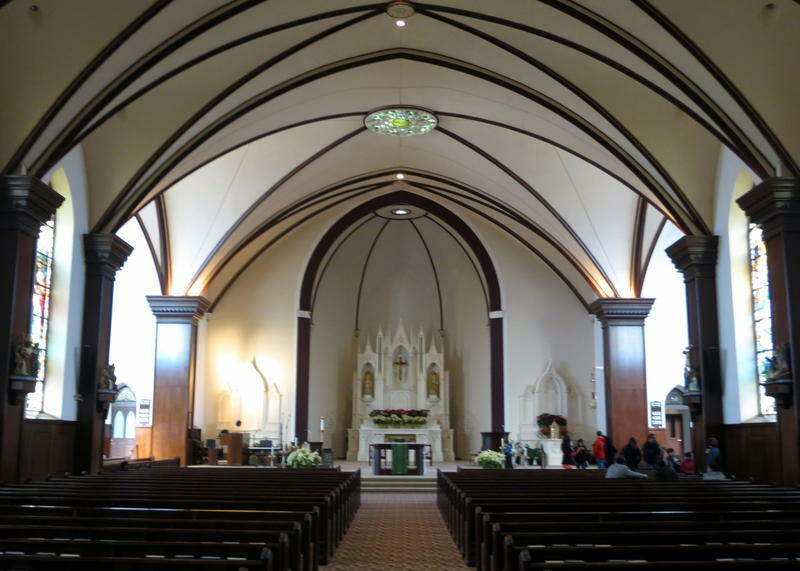 ROSE: After a quick prayer, Katz ushers Lorenzo to her appointment. ROSE: Across the U.S., judges have issued final deportation orders for more than 900,000 people in the country illegally. Nonetheless, many remain as long as they check in regularly with ICE. Under the Obama administration, they were not considered priorities for deportation because they had clean criminal records or strong ties to their communities. But the Trump administration is taking a more aggressive enforcement stance. HANS VON SPAKOVSKY: I certainly hope that they are. ROSE: Hans von Spakovsky is with the Heritage Foundation, a conservative think-tank in Washington. He was glad to see Trump sign executive orders that broadly expand the number of people who are priorities for deportation to include many whose only criminal offense may be entering or staying in the country illegally. Von Spakovsky says criminals should be the priority, but that doesn't mean everyone else should get a free pass. VON SPAKOVSKY: You're in the United States illegally. You broke the law to come here illegally, and a government agency is basically saying that's OK. We're not going to do anything about it. I mean, that just to me is a complete violation of the rule of law. ROSE: An ICE spokeswoman did not respond to questions about the check-ins. But in recent weeks, some immigrants say they've been detained without warning at their ICE check-ins. Those cases have gotten a lot of attention and could have unintended consequences, according to Alonzo Pena. ALONZO PENA: That's going to send a bad message to others, and that's going to really backfire because you want people to report. The reason we have this system - we cannot detain everybody. ROSE: Pena served as deputy director of ICE under the Obama administration. If agents detain large numbers of immigrants at their check-ins, he says, others may decide it's too risky to report. PENA: They lose faith in the system, and you don't know where they're at. There's nothing good that will come out of that. ROSE: Back in Baltimore, Florinda Lorenzo emerges from the ICE field office with a smile on her face. LORENZO: (Through interpreter) I feel very happy right now. My heart isn't as heavy anymore. I don't have the words, but I feel relief. ROSE: Lorenzo found out that she can stay at least for a few more months. 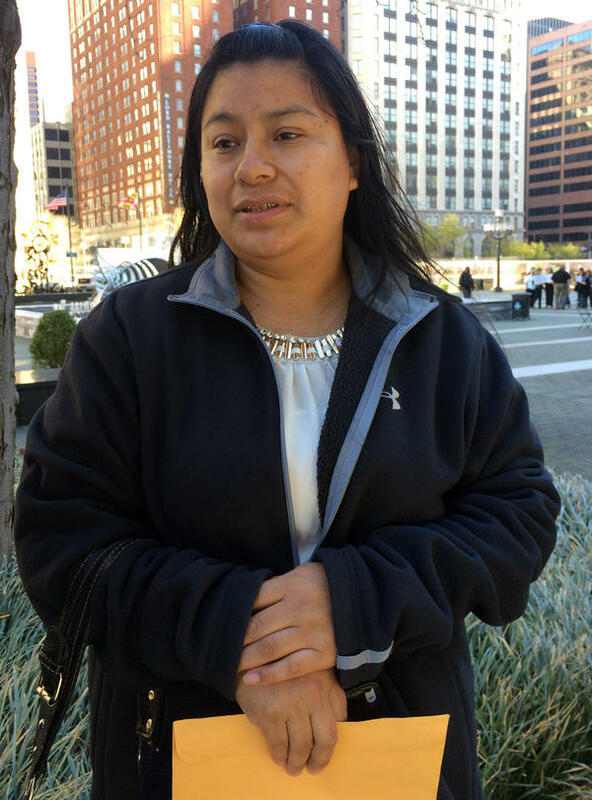 She doesn't have to check in with ICE again until October, but neither Lorenzo nor her lawyers can say what will happen when she does. Joel Rose, NPR News. Transcript provided by NPR, Copyright NPR.